Become a Certified Hypnotist in just 5 Weekends! Classes start Saturday, February 23, 2019. Become A Certified HYPNOCOUNSELOR. Certified Hypnotists are approved by the National Guild of Hypnotists. Upon graduation automatically become a member of the largest Hypnosis Organization in the World. Full or Part-time Profession. Work With Real Cases - Hypnotize Students After First Day. Become a HYPNOTIST to offer highly beneficial services complementary to the medical profession. Become a respected professional in a truly rewarding profession. Hypnotism is now 'mainstream'. Act Now. Class schedule: Saturdays and Sundays, 9am-5pm, beginning on 2/23/2019. Classes start Saturday, September 29, 2018. Class schedule: Saturdays and Sundays, 9am-5pm, beginning on 9/29/2018. I will be attending the 31st Annual National Guild of Hypnotists Convention in Marlboro, MA August 10-12, 2018. It's an opportunity for me to meet up with friends and associates and to attend seminars and workshops to expand my techniques. There is always something new to learn at every convention. Classes start Saturday, February 24, 2018. Class schedule: Saturdays and Sundays, 9am-5pm, beginning on 2/24/2018. This is a 5 hour virtual online World Hypnotism Day presentation open to any and all to view. Click on the World Hypnotism Day link above to get more information about the program and how to participate. Classes start Saturday, May 5, 2017. Class schedule: Saturdays and Sundays, 9am-5pm, beginning on 5/6/2017. Classes start Saturday, February 25, 2017. Class schedule: every Saturday and Sunday, 9am-5pm, beginning on 2/25/2017. February 25-26, March 3-4, 11-12, 18-19, 25-26. Classes start Saturday, September 24, 2016. Class schedule: every Saturday and Sunday, 9am-5pm, beginning on 9/24/2016. September 24-25, October 1-2, 22-23, 29-30 and November 5-6 2016. I'll be attending the National Guild of Hypnotists Convention August 12, 13 and 14 in Marlborough MA. Classes start Saturday, April 2, 2016. Class schedule: every Saturday and Sunday, 9am-5pm, beginning on 4/2/2016. April 2, 3, 9, 10, 16, 17, 23, 24, 30, and May 1, 2016. Alice Rich shall describe how Reiki discovered her, and explain about this spiritually guided life-force. It includes meditating on precepts, breathing techniques, learning symbols, palm healing, and an attunement or blessing from a teacher. Reiki reduces stress which in turn helps the body create and maintain balance which allows the body to heal itself. Reiki can, reduce pain, set goals, prepare for surgery, lessen the side effects of medication, and encourage a healthy lifestyle. Alice shall demonstrate that one can feel heat, tingly, relaxed, refreshed, fall asleep, or sometimes dream. Reiki is intelligent energy which goes to where needed, and has changed Alice’s life, her family’s life and it can change yours. Alice Rich has a Masters Degree in Public Administration and a Bachelors Degree in Business Ad-ministration. She first became a Certified Usui Reiki Ryoho Master Practitioner to heal herself, her family and her friends. The positive results that all experienced encouraged her to continue her spir-itual mind, body studies and become a Certified Master Teacher in Usui Reiki Ryoho, Tibetan and Karuna Reiki®, and a Certified Master Teacher in Crystal Healing as well as a Certified Integrated Energy Therapy® (IET) Master Instructor, Certified Hypnotist and Certified Angel Therapy Practitioner®, Certified Angel Card Reader, Past Life Healer and Medium certified by Spiritual Dr. Doreen Virtue. She is also an Ordained Minister and joyfully perform weddings. She has been a health and wellness professional for over thirty years and owned a health food store in New York City for seven years. Alice is a fun person and you’ll enjoy the demonstrations and entire presentation. I teach the self hypnosis portion of the Academy of Professional Hypnosis Certification Class. If you are interested in becoming a Certified Hypnotist, then consider attending the next class offering on February 6, 2016. This is the last time it will be offered at this price. So get in now before the rate increase!! Please join us on Saturday, January 30, 2016 from 1-3pm for lunch and an introduction to everything hypnosis!! We will be speaking about hypnosis, conditions for Certification and practice in the State of NJ, and having a question and answer session. All attendees will also receive a free crystal pendulum and instruction on its use and incorporation into your practice. All interested parties must RSVP in advance. Please contact us at (908) 964-4467 for more info. Don't miss this opportunity to learn about hypnosis!! We look forward to meeting you!! Ever wonder what hypnotist are really like? Come spend the evening in the company of some of the best hypnotists north of the Raritan River. There will be lots of NACH members there to network with. You don't even need to be a member to attend. I look forward to meeting you there. Feature speaker: Petra, a Pennsylvania hypnotist who shall be returning from presenting in Germany in October. The topic is: READING BODY LANGUAGE This is exciting and a ‘must see’ presentation. There are so many subconscious body movements by all persons that are clues to their thoughts, attitudes, frames of mind and their comfort with the words that they are saying. Petra is an excellent teacher!! If you are interested in becoming a Certified Hypnotist, then consider attending the next class offering on May 30, 2015. (311209) THE HOUR OF WILLPOWER---Give Your Clients More of What They Want---Willpower! Maligned and misunderstood, yet irresistible and unstoppable. It drives fearless acts of courage, yet gets blamed for disappointing failures. A product of biology and neurology, it only succeeds when its parts are balanced, aligned and harmonized. You clients want more of this than anything. Willpower---The cooperative convergence of the conscious mind's "will" and "power" of the subconscious. Discover the things you must do for your clients so they strengthen, replenish and conserve their willpower. Come see me give this exclusive seminar at the 65th Anniversary National Guild of Hypnotists 28th Annual Convention. The Hour of Willpower: Give your clients more of what they want---Willpower! I am on the faculty and will be presenting at the 65th Annual National Guild of Hypnotists Convention. If you are interested in becoming a Certified Hypnotist, then consider attending the next class offering on January 31, 2015. Feature speaker: John Cerbone, The Fastest Hypnotist Alive. Stress affects the minds and bodies of men and women, rich and poor, young and old in harmful ways. Stress can cause poor concentration, forgetfulness, and mental fatigue. Or worse, stress may cause hyper-tension, heart attacks, strokes—even death. Many try on their own to rid stress from their life and fail. Let Stress-Less (tm) Hypnosis bring you the stress relief you seek. You can find a link to registration on the same page. Feature speaker to be announced. If you are interested in becoming a Certified Hypnotist, then consider attending the next class offering on October 11th, 2014. Become your own self-hypnotist! Discover how to enter and emerge from self-hypnosis at will, alter bad habits for the better, remove negative imprints made on you earlier in life, prevent future negative imprints, achieve deep and complete relaxation, resolve inner conflicts which may be blocking your full creative expression or preventing you from reaching your goals. Course fee includes a 90 page illustrated workbook/ reference manual. You can also find a link to course registration on the same page. If you are interested in becoming a Certified Hypnotist, then consider attending the next class offering on September 6th, 2014. Joes Peoples will be presenting: (in his own words) "I am drawn to using hypnosis in a forensic manner, using a variety of methods to peel the onion and get to the cause of issues that are out of the conscious awareness of the client. This would be especially useful for those new to hypnosis, bridging the gap between induction and using the correct intervention. Less pre-talk and more exploration, once the subconscious mind is engaged. Some of the methods I use are NLP Strategy elicitation, Meta Model questions, Guided Imagery, conversations with Parts. I'll keep it light, using tidbits from sessions, with clients." If you are interested in becoming a Certified Hypnotist, then consider attending the next class offering on May 24th, 2014. I am presenting my Stress-Less™ with Hypnosis program on April 8th at the West Windsor Plainsboro High School. The course fills up quickly as seating is limited, so register early! Price: $2,385 includes all course materials. If you are interested in becoming a Certified Hypnotist, then consider attending the next class offering on March 29th, 2014. The class dates are Saturdays & Sunday 9AM-5PM: March 29 & 30, April 5, 6, 12,13 (then a week off for the Easter Holiday), resume on April 26, 27 & May 3, 4. I am presenting my Self Hypnosis for the Life You Want course on four consecutive Tuesdays starting March 4th at the West Windsor Plainsboro High School. The course fills up quickly as seating is limited, so register early! I am also an instructor at the Academy of Professional Hypnosis. There I teach the self-hypnosis portion of the Hypnosis Certification Course. If you are interested in becoming a hypnotist, then please follow this link to the Academy website to learn more about the course starting in February. There is still time to register. Also note that course size is limited to ensure personal one-on-one training. Watch for announcements in your area about the upcoming World Hypnotism Day 2014! I am presenting my Mastering the Art of Self Hypnosis Course on four consecutive Tuesdays starting November 12 at the West Windsor Plainsboro High School. This course will not be presented again until spring of 2014. The course fills up quickly as seating is limited, so register today! Advanced Clinical Hypnosis Training Course Continues 7/13, 7/14. See complete description listed under June 8. Advanced Clinical Hypnosis Training Course Continues 7/6, 7/7. See complete description listed under June 8. Advanced Hypnosis Training Course Continues 6/29, 6/30. See complete description listed under June 8. Advanced Hypnosis Training Course Continues 6/22, 6/23. See complete description listed under June 8. Basic Hypnosis Training Course Continues 6/8, 6/9, 6/15, 6/16. See complete description listed under June 8. I am also an instructor at the Academy of Professional Hypnosis. There I teach the self-hypnosis portion of the Hypnosis Certification Course. If you are interested in becoming a hypnotist, then please read the press release for the upcoming course in June. There is still time to register. Also note that course size is limited to ensure personal one-on-one training. The Academy of Professional Hypnosis is very pleased to announce its upcoming Hypnosis Certification Course beginning on June 8th, 2013. In the past, you have communicated interest in the Academy of Professional Hypnosis and in hypnosis training and certification. We realize that your schedule is tight and that a reminder of our upcoming certification course may be in order. If you would care to receive a recent issue of the Journal of the National Guild of Hypnotists, we shall hard mail it to you. The value of hypnosis is truly great, but that value can only be appreciated by those persons that understand the proper use of the subconscious mind and its programming through excellent hypnotic techniques. This is what we teach at the Academy, with hands-on, student-to-student supervised practice. PERFORM DUE DILIGENCE: We suggest that you look at other hypnosis offerings to compare to the Academy of Professional Hypnosis. Be sure to ask for a copy of the License of the New Jersey Department of Education and Department of Labor & Workforce Development. You may see this Academy’s Certificate below. 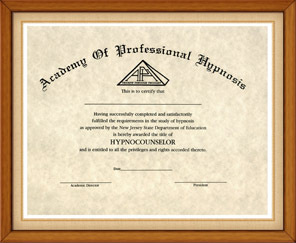 We are the first school of hypnosis approved and licensed by the Department of Education of the State of New Jersey, since 1991. (administered by The Department of Labor & Workforce Development) The Academy offers a 100 hour certification course which upon completion, results in being awarded a Diploma as an Advanced Clinical HypnoCounselor. (You may also use the titles of Hypnotist or Consulting Hypnotist as it is your choice to do this). We believe in student-to-student 'hands-on' teacher supervised practice dealing only with real life issues. Through this, the student experiences the feelings which clients experience, and also gains the opportunity to work on issues that have been troubling the student for quite some time. Most of our students graduate with a sense of growth and personal insight. All of our students are able to work with clients immediately upon graduation with issues such as smoking cessation, weight management and situational stress. Our Academy’s voluminous course book contains techniques, scripts and other information. You may visit our website at www.hypnoacademy.com to read about our courses and feel free to contact us if you have any questions. The upcoming school dates are: Email your hard mail address and we shall send you a recent NGH Journal of Hypnotism for your enjoyment. Please send your registration check to Academy of Professional Hypnosis, 1358 Burnet Avenue, Suite #1, Union, NJ 07083 or register online and either enter your credit card information or telephone the info to the below number. You may view the hypnosis credentials and awards of Anthony F. De Marco, your Instructor, and also view video clips of his celebrated imaginary gastric band weight management program utilized throughout the world at www.thinnerbandhypnosis.com. Upon graduation you would eligible to participate in The Thinner Band Hypnosis Program. Dr. De Marco is also the author of the law of hypnosis in New Jersey which is contained in the Exemption to Practice of the Rules of the New Jersey Board of Psychological Examiners. Anthony F. De Marco, LL.B., Ph.D.